The entire concept of GREEN has not only taken the wood products industry, but the entire world by storm. Being "enviromentally friendly" and focusing on "green building" are two catchphrases that have gained impact, recogniton, and consciousness in today's educated society. 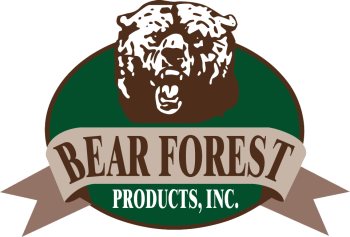 Bear Forest Products recognizes the further need for knowledge and source of supply for these GREEN products. We strongly believe in the idea of quality products at competitive prices being readliy available to our valuable customer base. We now strive to create more value to our customer base by being a resource of material, and more importantly a resource of information regarding the GREEN intitiatives we are all now involved with. The benefits of GREEN building conribute to the protection of our ecosystem, by improving air quality and conserving natural resources. GREEN constructed building are not only less strenuous on the enviroment, but they are also durable, comfortable, and increase resale value, making them excellent investments. Establish a common standard of measurement for GREEN building. Certified (26-32); Silver (33-38); Gold (39-51); Platinum (52-69). The LEED Green Building Rating System does not award points to any individual product. Instead, the cumulative environmental benefits of multiple products used in a given project, collectively contribute to earning LEED points. Currently, LEED criteria only recognizes wood certified through the Forest Stewardship Council® (FSC®) governing body.